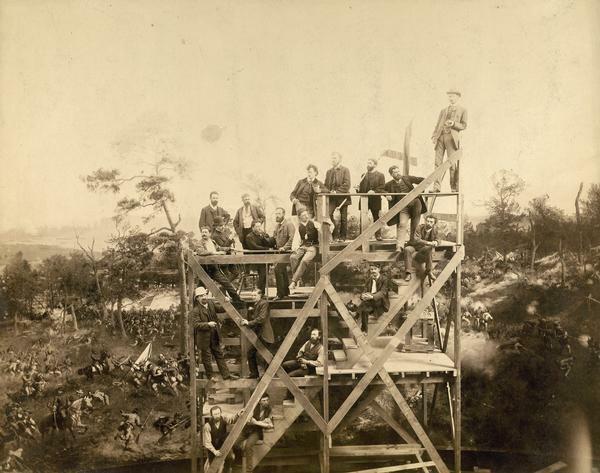 Group portrait of a group of German panorama painters on a scaffolding in their Milwaukee studio, with The Atlanta Cyclorama as a backdrop. Included in the group are, standing from the top left: Franz Bilberstein (landscapes), August Lohr (supervisor and designer of landscape settings), Herman Michalowski (figures), Feodor von Luerzer (landscapes), Franz Rohrbeck with flag (figures, especially Confederates), Theodor Breidwiser (figures), Johannes Schulz (seated) (figures), and Otto Dinger at the top right (figures). In front of them from the left with large moustache, Albert Richter (figures), Gustav Wendling (figures), Bernhard Schneider (landscapes), Bernhard (Wilhelm?) Schroeder (Schroeter?) (landscapes), and Paul Wilhelmi (figures). Standing in the center are Friedrich Wilhelm Heine (supervisor and master of composition) with Theodore R. Davis, a reporter who had reported on the battle. Robert(?) Schade is one of the men also seated at that level.